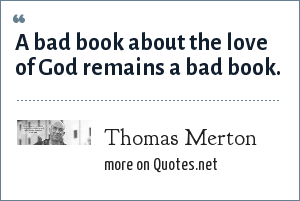 Thomas Merton: A bad book about the love of God remains a bad book. A bad book about the love of God remains a bad book. "Thomas Merton Quotes." Quotes.net. STANDS4 LLC, 2019. Web. 18 Apr. 2019. <https://www.quotes.net/quote/15674>.